Thank you for purchasing the Wyalusing Atlatl Kit. We hope you will find it a pleasure to finish and use. Your kit contains a wooden shaft, a tine made of antler, artificial sinew and sandpaper. You will need a small amount of wood glue, scissors and Tung oil or Linseed oil to finish your kit. We recommend Elmer’s Carpenters Glue, Franklin Tightbond or epoxy. First starting with the coarsest sandpaper, sand the wooden shaft. Progress to the medium sandpaper and finish with the finest or until you are satisfied with the finish. After sanding, rub the entire surface of the wood except for the area where the antler tine attaches to the atlatl with Linseed oil or Tung oil. Other commercial finishes may also be used. After obtaining the look you want, then gently sand and oil the atlatl. After the finish is applied, glue the antler tine in place (see picture) with the wood glue or epoxy. Wipe off the excess and let it set. You can finish your atlatl with the artificial sinew if you wish. Take the sinew from your kit and find its middle. Put half through the hole in the top of your atlatl. Evenly wrap the sinew around the tine two or three times. Go back through the hole and go to the back of the atlatl and make a knot. (See diagram on back of this sheet). Go to the front of the atlatl and make another knot on the front of the antler, wrap the area with the sinew two or three times. Go back to the hole and go under the head of atlatl. 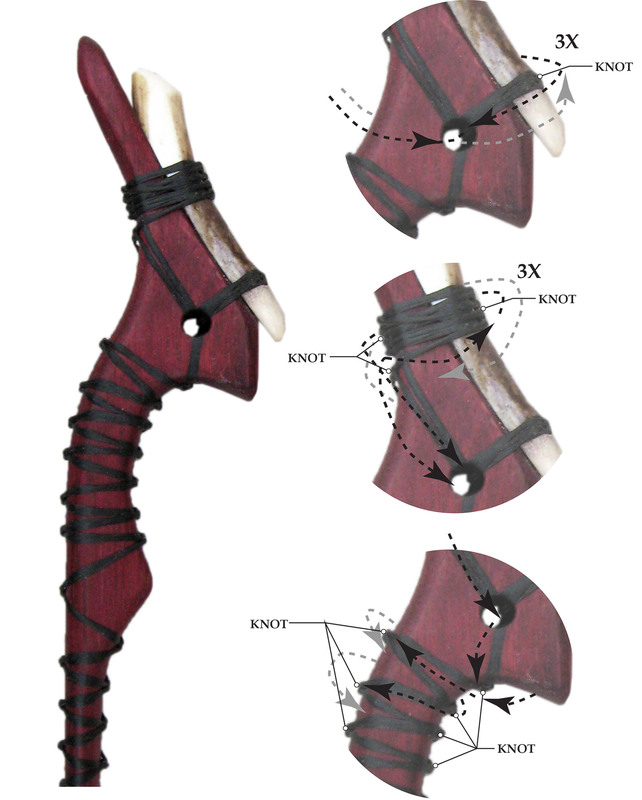 Using square knots or a crisscross pattern, weave the sinew down the shaft of the atlatl. When you reach the end of the shaft, before the finger holes, bring the sinew past the first bump and tie it around the end several times, then knot it off and trim the sinew. You have now completed your Wyalusing Atlatl.